The Latvian Embassy in Seoul signed a memorandum of understanding with the Korean Bar Association on Nov. 6 to promote legal cooperation between Latvia and Korea. 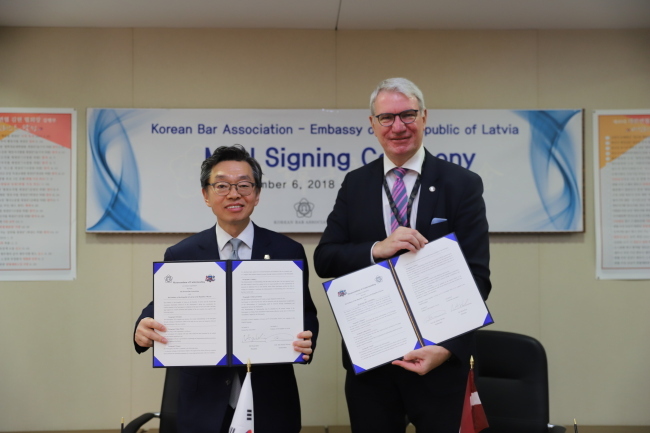 Latvian Ambassador to Korea Peteris Vaivars and Korean Bar Association President Kim Hyun signed the agreement aimed at strengthening bilateral mutual exchanges, including training programs, the provision of legal assistance in trade and experience-sharing, according to the diplomatic mission. “Latvian President Raimonds Vejonis visited Korea in February to participate in the PyeongChang Winter Games, where Latvian athletes competed, and promoted our bilateral ties. Furthermore, our former President Valdis Zatlers (2007-11) and his spouse also visited Korea in October and expressed deep interest in our bilateral ties,” said Vaivars at the event. Riga is marking the 100th anniversary of its republican proclamation this year with a series of events both in the country and in Korea celebrating the Baltic nation’s modern achievements amid its tumultuous history.